2mm North East Area Group: North East Group in action 11/8/07. North East Group in action 11/8/07. 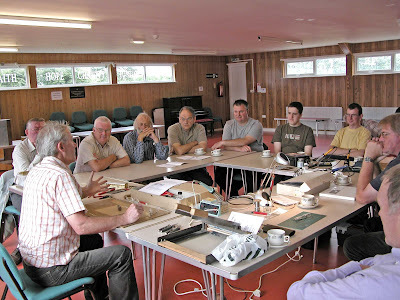 The photograph above shows the members of the North East Group listening in to Allen Doherty's session on soldering his Worsley Works 'aids to scratch building' together. These items have become very popular with 2mm modellers and Allen is very willing to 'shoot' almost anything down to 2mm. I think everyone agreed that Allen was very informative and entertaining. It wasn't long before he had the bare bones of a 3mm coach put together in a very short time. It was quite a good idea for him to use a 3mm coach because we could all see quite easily what was going on. It was then the turn of those present to set to and build one for themselves. For myself I chose to embark upon the Worsley Works Class 25 Bo-Bo diesel that had been in my gloat box for some time. All part of the build up to the blue era layout that's swirling around in my head. Rod McCall started a Derby Lightweight set of etchings and 3 other people tried their hands at soldering during the session. I would have liked to have seen more - indeed brought some more spare soldering irons with me for others to borrow but in the event only one of my spares was used. Still a good session though and thanks to Allen for coming along to see us. I am sure some of the techniques will 'rub off' on us. Just prior to the meeting two group members got too close to a spinning wheel and were drawn into the contributors circle. It's always a risk you take.....................!